We live in an era of disruption. What you did yesterday will not work tomorrow. Fail to change and you will fail. AI is the most significant new technology for almost every sector. It will be net jobs generative! European central bankers really are as boring as you might imagine. The future of digital is analogue. The technology is easy compared to getting your people and culture right. Spanish sugar packets have 2 spoonful’s in them. Awesome! The new reality is that infrastructure is global and fluid. By 2019 50% of all durable goods will be IoT configurable. The IoT will revolutionalise healthcare, if healthcare can stop working in silos. Master IT people are business professionals first, technicians second. Digital value can (must) be delivered at pace and at scale. These are all important but there is one more thing that sticks in my mind and it’s a question, not an answer. As I was sat on La Rambla last night, eating my rip-off tourist café sandwich and watching a wide cross section of society walking by, I read an interesting blog post where the author wondered aloud why so many of Barcelona’s street people had dogs. Was it companionship or marketing? Such weighty philosophical questions are beyond this small brain of this particular bear but rather I am left pondering a different question. Irrespective of whether these dogs are adept marketing tools or friends in a time of great need, how are they all so well behaved? As somebody whose house appears to have a revolving door for rescue animals (actually revolving implies that some ever leave, we must have a one way door) I know beyond any shadow of a doubt that none of the dogs in through that door would ever patiently sit silently, watchfully, unleashed, on a blanket at the side of the road, looking soulful and hungry (though well fed and cared for), motionless as the world walks by carrying with it the smell of paella, burgers and sausages. 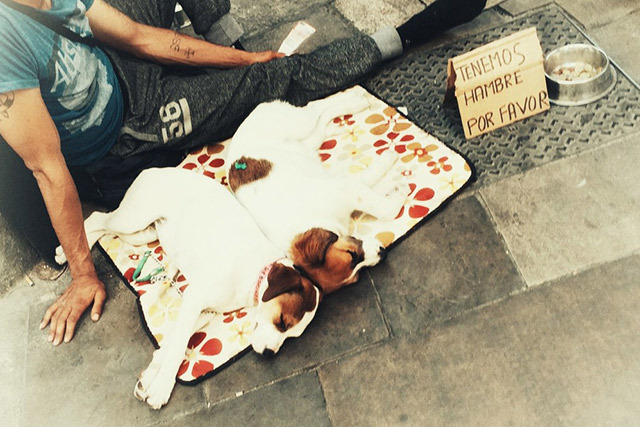 Street dogs of Barcelona, I salute you.